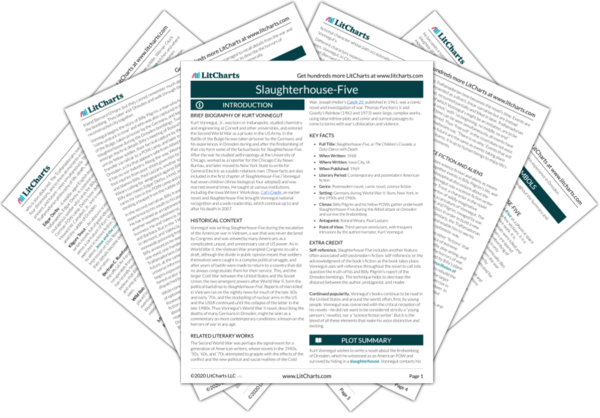 Instant downloads of all 942 LitChart PDFs (including Slaughterhouse-Five). 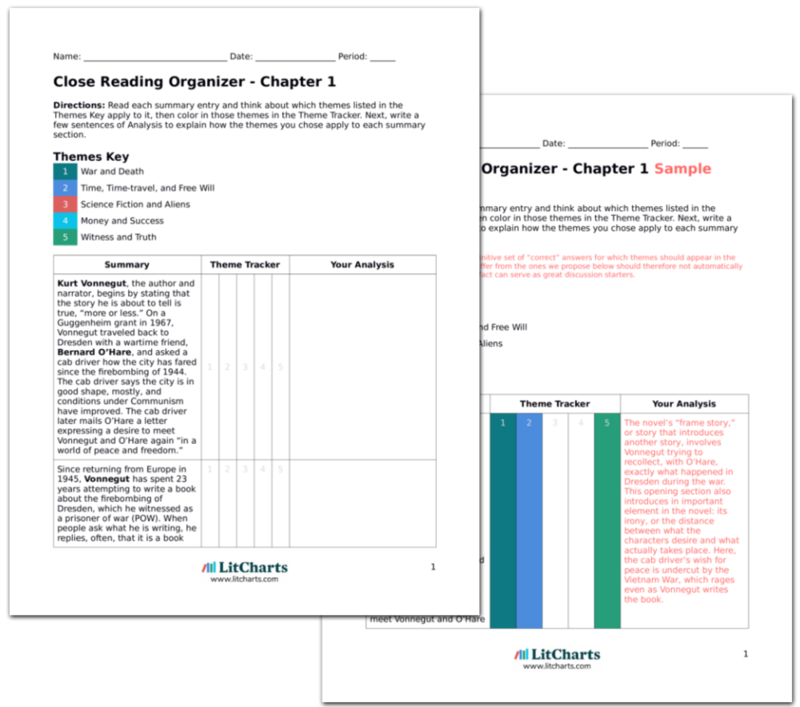 LitCharts assigns a color and icon to each theme in Slaughterhouse-Five, which you can use to track the themes throughout the work. After treatment for his breakdown, Billy married and took up his father-in-law’s optometry business, becoming wealthy and having two children, Barbara and Robert, the latter becoming a Green Beret serving in Vietnam. In 1968, Billy is involved in a chartered-plane crash en route to an optometrists’ conference; he is the sole survivor, though he suffers a grave head injury. His wife dies of carbon monoxide poisoning while Billy is hospitalized. Another juxtaposition, or comparison, of Billy's success and misfortune. He makes quite a bit of money and has a family of his own, but that family is plagued by violence and death—he himself nearly dies in a plane crash, and this causes his wife’s death indirectly. His son’s participation in the war in Vietnam gives Billy some pause, although he does not feel the need to protest that war, as Vonnegut later describes. After the accident, Billy goes on the radio in New York City, claiming he was abducted by aliens, the Tralfamadorians, in 1967, and displayed on Tralfamadore in a zoo. His daughter hears the broadcast and fears that Billy is now suffering from dementia after the plane crash. Billy later describes the Tralfamadorians, saying they are “two feet high, and green,” shaped like a plunger, with a hand atop the shaft and an eye in their palm. Tralfamadorians perceive in four dimensions, meaning they “see” time differently from humans. Billy’s grip on reality is called into question; it is never clear whether the Tralfamadorians are creations of his imagination, ideas taken from Kilgore Trout novels, or actual experiences of Billy’s. The description of the Tralfamadorians is less important, throughout the rest of the book, than their ability to see time “all together,” as is here introduced. More doubt is cast on Billy’s mental state. The “Rocky Mountains” metaphor for time crops up multiple times throughout the novel. The peaks and valleys of one’s life, seen all at once, appear, like the mountains, fixed and immoveable, unable to be changed. Thus the Tralfamadorian concept of time both allows one to see one’s entire life and makes that life seem fated, impossible to change, like the mountains themselves. 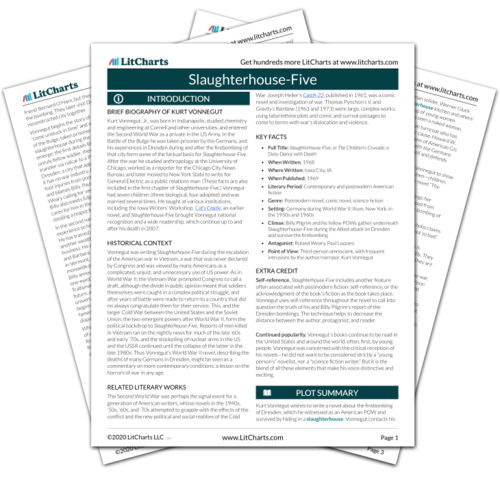 Get the entire Slaughterhouse-Five LitChart as a printable PDF. The phrase “So it goes” becomes one of the novel’s great refrains—it is perhaps Slaughterhouse-Five’s most recognizable sentence. The phrase is short but contains multiple readings. When someone dies, Vonnegut seems to comment that this death could not be helped. But the phrase also contains a kind of hope: that death itself isn’t so bad, that all things must die, and that life must be lived in appreciation of its best moments. Billy is then shipped to Luxembourg and to the fighting at the Battle of the Bulge in December 1944. He never meets the chaplain whom he is to help. Instead he is caught in the frenzy of fighting and walks, “dazed,” behind enemy lines, where he runs into an American anti-tank gunner and two American scouts. Billy’s shoe is missing a heel, and he lacks a proper uniform. He is nearly killed by a stray German bullet, as the Germans are patrolling the recently captured territory, but is convinced by Roland Weary, the gunner, to dive into a ditch. Billy is, quite simply, a bad soldier. He is not prepared for war, does not carry a gun, and is totally disoriented by the collapse of the battle lines once the Germans have overrun the Allies at the famous Battle of the Bulge. Yet Billy is also “lucky.” He is not killed by the stray bullet and is in fact saved by Weary. Weary seems to recognize Billy’s luck, later, when Weary dies of gangrene and blames Billy for his own misfortune. Weary, also new to combat, is the only survivor of German tank fire in his unit. Weary grew up “unpopular” in Pittsburgh because of his looks and violent temper, and his father collected instruments of torture, which Weary describes to Billy in the field. He explains a “blood gutter,” or the trough on the side of a sword. It is revealed that, although Billy had a crucifix (Jesus on the cross) in his room as a child, his family was not religious. Jesus occurs again and again in the novel, though not necessarily as an object of religious reverence—Billy himself does not feel religious, but he keeps the crucifix on his wall as a child. Jesus, later in the book, becomes instead a symbol of “otherworldliness,” a character who travels between heaven and earth, and who develops the novel’s ideas on fate, time, and what it means to die. Weary, Pilgrim, and two scouts continue through the snow, hoping to avoid detection by the Germans. Weary shows Pilgrim a lewd photograph of a woman and a pony, which Weary bought in the Tuileries in France. Weary imagines aloud that he has survived the war and is narrating the story of his escape to his family: he and the two scouts, the “Three Musketeers,” have avoided the Germans heroically. But Weary must stop daydreaming in order to double back and find Billy, who has fallen far behind. Weary’s fantasy of success involves the creation of a battle unit and friend group such as he never had growing up in Pittsburgh. Weary is greatly disheartened when this fantasy is disturbed. The lewd photograph, too, is “unstuck in time,” seen by Billy here and much later, in an adult bookstore in New York City. Pilgrim is leaning against a tree; this, according to Vonnegut, is when he “first comes unstuck in time.” He is learning to swim with his father, who throws him in the pool; he is visiting his sick mother in a nursing home, when she asks him “How did I get so old?” He is at a banquet for his son’s little league team. He is in a room with another woman, not his wife, at a party; he is drunk. He passes out in the back seat of his car and is woken up by Weary, back in the war. Here time-travel, drunkenness, and aging are all combined. Billy’s ability to travel through time is often prompted by states of tiredness, anxiety, or inebriation. His mother’s question—“How did I get so old?”—becomes a broader meditation on time itself. Even though we know time will pass, that it cannot be stopped, still we feel surprised at our own aging and mortality. Weary rescues Pilgrim by the tree, though Pilgrim wishes to be left behind or to “turn into steam” by the riverbank and drift away. The scouts abandon Weary and Pilgrim. Billy comes unstuck again and is giving a speech in front of the Lions Club—he is the new president and has become a confident public speaker. Weary begins beating and kicking Pilgrim on the ice of the frozen creek, and Pilgrim laughs. Five Germans discover them. This scene deftly contrasts Billy’s current, miserable state and his future success, if not complete happiness. Vonnegut uses Billy’s time-traveling abilities to create these kinds of comparisons—between linear time and Tralfamadorian time, between success and failure, between violence and peacefulness. Schlegel, Chris. "Slaughterhouse-Five Chapter 2." LitCharts. LitCharts LLC, 16 Sep 2013. Web. 28 Feb 2019. Schlegel, Chris. "Slaughterhouse-Five Chapter 2." LitCharts LLC, September 16, 2013. Retrieved February 28, 2019. https://www.litcharts.com/lit/slaughterhouse-five/chapter-2.